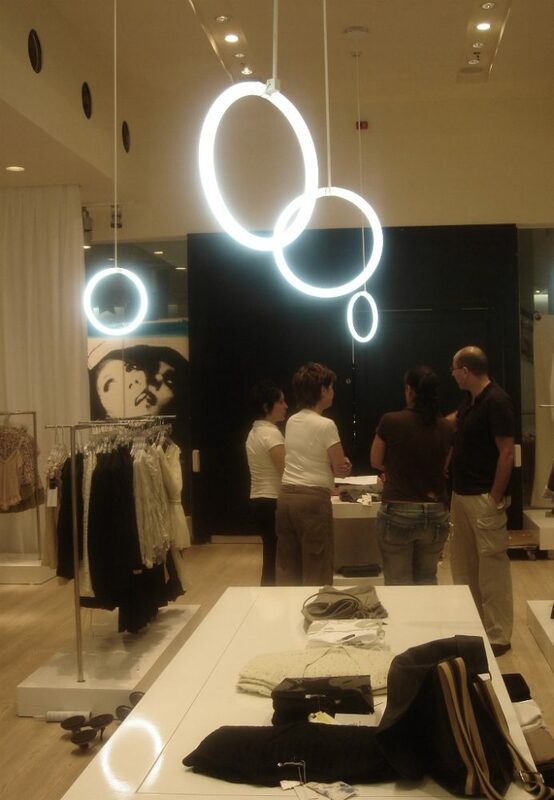 Iris Design Studio’s Iguazu Neon System, a contemporary pulley lamp, one of Iris Design Studio‘s best selling designs, has been featured in a clothing chainstore for the past 6 years. This month we have reached our 60TH store, and are still growing. The Iguazu Neon System was designed with a pole especially for this retailer. For each store we produce the length of the fixture according to the ceiling height, so it would be floating above people’s heads imitating angel halos. We have been producing this pulley lamp for almost a decade, and although its simplicity it is considered a sophisticated and clever design among the trade. The inspiration for this light fixture is from the wonderful Iguazu falls: “If you have not visited the Iguazu falls you should. Nature’s power and immense forces are shown in their greatest glory. These falls made me realize how beautiful this world can be if we only let the natural planet energies to grow.” Iris Kadouri Rizenbah, Designer and Founder of Iris Design Studio.